The Levant Party, Russia's dirty hands in Lebanon? Russia has slowly but surely been expanding its influence in the Middle East. In the third and final part of a DW exclusive, Benas Gerdziunas looks at the Kremlin's sway on Lebanon's Levant Party. During a 2013 meeting of the Orthodox Gathering reported by the Lebanese newspaper Al-Akhbar, Rodrik Khoury — the head of the Levant Party, a fringe pro-Moscow movement within the Orthodox Gathering network — proclaimed that "in the house of his grandfather hung a portrait of the Russian Emperor Nicholas II, and in his house a portrait of Russian President Vladimir Putin." The party has never revealed its true membership numbers, instead boasting repeatedly of its "6,000 followers on Facebook." In November 2017, Khoury met with Sergei Gavrilov in Moscow, the head of Duma's Committee for the Defense of Christian Values, and also members of the Imperial Orthodox Palestine Society (IOPS). Before that, in April, Khoury, who is also a member of IOPS, was pictured together with Russia's deputy foreign minister, Mikhail Bogdanov, at an Orthodox Gathering meeting. 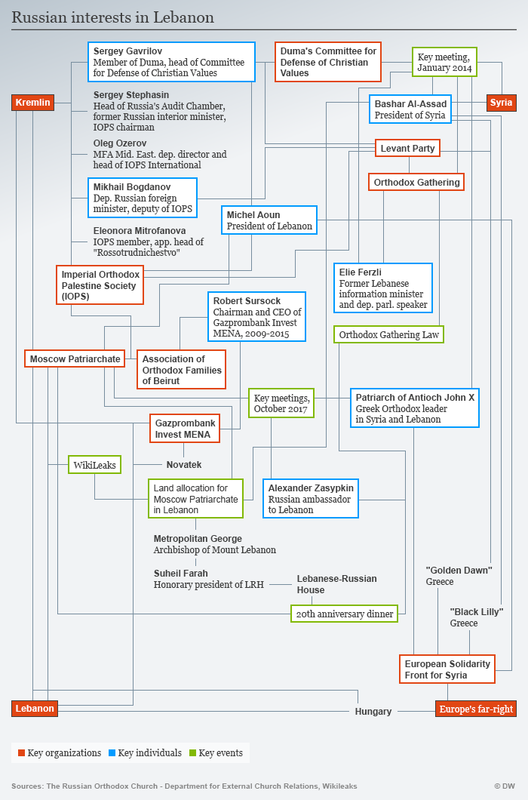 Although it is largely seen as a fringe entity within Lebanon's fragmented political scene, the Levant Party has received disproportionate attention from Russian delegations, as well as appearing prominently within the Orthodox Gathering network. Subsequently, the party has toed the Kremlin's line, issuing statements condemning alleged US interference in Ukraine and its support for the Syrian opposition. Supporting fringe political elements and opposition groups hostile to the perceived western values has benefited the Kremlin in the past. Italy's Lega Nord went from fringe political outsider, to the unlikely kingmaker in Italy's 2018 elections. Its leader, Matteo Salvini vied for the Kremlin's support even before 2014, when the party was a political outsider and Putin was still engaged in dialogue with mainstream European political forces. Levant Party representatives have also visited Greece a number of times, and the party has a dedicated Greek language section on its website. In Greece, the same narrative has been picked up by the Golden Dawn party, which shares links to the Kremlin and Bashar Assad's regime in Syria, and by other fascist organizations around Europe, including the European Solidarity Front for Syria (ESFS). Their network includes far-right and pro-Russian movements from Italy, Belgium, France, Germany and Greece — but also the Czech Republic, the UK, Poland, Serbia, Spain and Romania. During multiple visits to Syria in May 2015, ESFS officials met with Patriarch John X of Antioch in Damascus, whose authority encompasses Lebanon as well as Syria. The Patriarch has facilitated meetings between Russian and Lebanese politicians and clergy in Beirut. In May 2016, ESFS claimed to have held a meeting with Lebanon's President Michel Aoun. However, no further details emerged. The Greek fringe fascist organization "The Black Lilly," who is also a partner of the ESFS, is reportedly fighting alongside Assad's forces in Syria, albeit in small numbers. However, exact information about their role in Syria is scarce. In Lebanon, the ESFS has embraced the same rhetoric of "protecting Christians" used by Russian officials and representatives of European far-right parties, using social media to circulate the perceived existential danger Christians face in Lebanon. Hungarian Prime Minister Viktor Orban has used such anti-Muslim, populist rhetoric to cater to his domestic support. In June 2017, Orban pledged 2.4 billion forints ($9.5 million) "to support properties in Hungary affiliated with the Moscow Patriarchate." Crucially, Hungary will also spend $1.7 million to restore churches in Lebanon. This comes despite the 2011 census that revealed that only 0.1 percent of Hungary's population declared themselves Orthodox Christians. Since the Ottoman capitulations in the 16th century, European forces have used minority protection as a political tool to loosen the Ottoman grip on the region. Historically, the French backed the Christians and the British the Druze to some extent, while the Russian Empire pivoted toward the Greek Orthodox community. 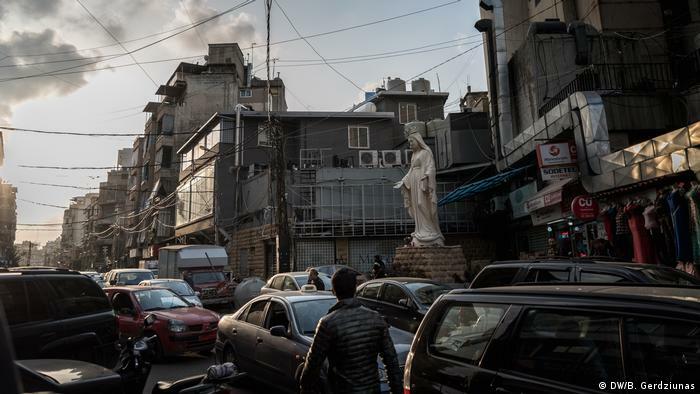 "The history of Beirut in the 19th century seems almost to coincide with that of the Christian missions," wrote Samir Kassir, a prominent Lebanese journalist, historian and professor. He was killed in 2005 by a car bomb, just weeks after Syria announced the end of its almost 30-year occupation of Lebanon. Following the collapse of the Soviet Union, Russia struggled to make an impact in the post Cold War era, but its engagement in Syria has helped to propel it back onto the international stage. Its military successes notwithstanding, Russia's regional soft-power options remain weak, even as it attempts to revive tsarist projects, such as the Imperial Orthodox Palestine Society. However, regardless of the posturing and bridge building, an apparent lack of funds to cover expenses with limited returns points to a further vulnerability in its approach. Still, the course of offering protection to a Russian-speaking minority was also demonstrated by the Kremlin's ability to use years of disinformation and Soviet nostalgia as a military tool during the annexation of Crimea in 2014. Future uncertainties in the region could pave the way for a mobilization of pro-Christian sentiment. As Elias Halabi, associate director of Sheikh Nahyan Center for Arabic Studies & Intercultural Dialogue at the University of Balamand, puts it: "Lebanese communities were shredded between supporting countries. For us, the end result is not encouraging." So, Sunnis have KSA, Shias have Iran, and Christians now have Russia. 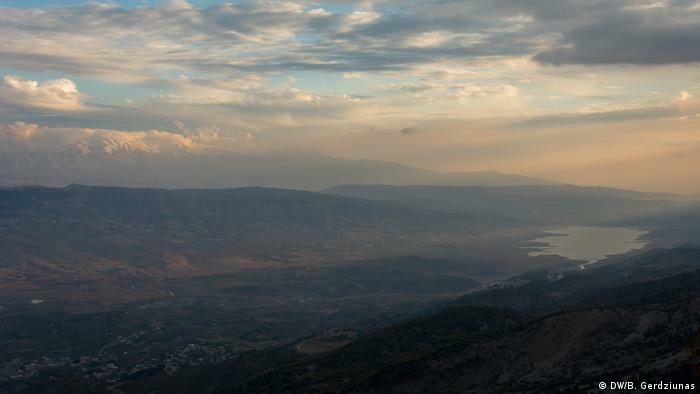 Who will the Druze have? Israel? halla2 Russia saret mni7a lama tarket the godless socialist communist cesspool??? ka2ano halla2 it is not allied with the islamic HA or Hamas of the 2000s. give me a break! the country is going to hell anyway let everyone enjoy it while it lasts. Im just pointing out FPMer hypocrisy and that you can apply the same logic here as well. I did not vote FPM and never will i vote for FPM, FM, HA, Amal, or any of these parties. Russia has recently been seen by many Christians all over the world as like guardians of the Christian faith. Funny enough, many muslims also see it as Russia is on their side. Russia supports Hamas, Taliban, Iran and its proxies, and generally like to show a pro-palestine stance , even though they have great relations with israel and wouldnt really put them in harms way. These muslims usually ignore Russia's support for far right groups in EU and USA and the massive anti-muslim media campaign the russians have launched in the past few years. Russian propoganda used to be much more pro-muslim than they are today. Just go to RT's youtube channel and check the videos theyve uploaded about muslims and islam the past few years compared to maybe 6 or 7 years ago. The EU, US, and facebook have also admitted to Russia spreading misinformation regarding muslims. So just like Christians ignore russia's support for Iran, hamas, taliban, and sending thousands of ISIS fighters to the middle east, the muslims also ignore Russia's clear anti-muslim face. Both of these muslims and christians are stupid IMO. I think they cannot see clearly what Russia is trying to do. Stupid article. Christians are more nationalist than any other sect in Lebanon. Shiaas of Lebanon backing clearly Iran. The closest to the Christians are the druze. Saying that Christians are influenced by Russia or USA or mother France is pure no sense. This is nonsense. Russia backs the the Druze. Christians have no one but their own strength. i think the HA-Iran connection is on an entirely different level than the rest.